A 16th round of the Trans-Pacific Partnership (TPP) negotiations is underway in Singapore. Canada and Mexico join the nine other TPP countries for the second time since the U.S. government invited its NAFTA partners to join late last year. The TPP is a super-sized trade deal-expanding on so called “next generation” trade and investment deals that NAFTA countries have pursued in the wake of the stalemate at the World Trade Organization. This pluri-lateral agreement poses serious new threats to North American communities — threats that a tri-national movement of trade justice activists is preparing to fight in the lead-up to a possible July TPP negotiating round in Canada. Since NAFTA was signed almost 20 years ago, all three North American countries have seen good jobs vanish, worsening income inequality, public services weakened through underfunding or offloaded to the private sector, increased food insecurity (in particular in Mexico), and ecosystems on the point of breaking. NAFTA promised a flourishing North American economy that would benefit all. In Jan. 2014, NAFTA has been in place for 20 years and the promised trickle down benefits have not been realized by communities. In the past 10 years, Canada has lost 500,000 manufacturing jobs. A new United Way Toronto report found that in and around Toronto, Canada’s largest city, 20 per cent of people are now employed in precarious, unstable or part-time jobs. This type of employment has increased by 50 per cent in the past 20 years since NAFTA was signed. In this same period, not a single notable social program has been introduced or expanded. Free trade has permanently eroded our sense of what people can do together for the common good. In Mexico millions of small farmers were displaced when NAFTA came into force in 1994 creating a massive push for migration to the United States. But NAFTA hit Mexico very hard again during the 2008-2009 financial crisis given Mexico’s dependency on the United States. In fact, Felipe Calderon’s presidency has been characterized by the slowest growth since 1954, a mere 1.58 per cent in average from 2007 to 2011, and, according to World Bank indicators, between 2007 and 2010, GDP per capita in Mexico decreased by 3.71 per cent, which is among the worst performance in Latin America. On Dec. 1, hundreds of labour, community, public health and internet freedom advocates from Canada, the U.S and Mexico descended on the Peace Arch Park in Surrey, B.C., between Washington State and British Columbia. The Tri-National Unity Statement that came out of that strategic gathering has been signed by hundreds of organizations representing tens of thousands of people across the continent. Since our Dec. 1 cross-border action, community and NGO organizations from central and Latin America are raising their collective voices in opposition to the TPP. This opposition was solidified at the People’s Summit in Santiago de Chile — parallel to summit EU-CELAC Summit — this past January where civil society gathered to express and share their concerns and develop strategies to stop it. They are calling out the TPP as a ‘tool of disintegration’ in the region because it attempts to destabilize regional processes of integration that challenge the neoliberal model inherent in the TPP. These alternatives include the Union of South American Nations (UNASUR) and The Community of Caribbean and Latin American States (CELAC), as well as economic blocs like MERCOSUR and ALBA trading regions. The TPP is seen in Latin America as a second attempt by the United States to push a Free Trade Area of the Americas (FTAA) in the region with help from countries whose governments are subservient to de the U.S. led neoliberal ideology and “free trade” economics. Stopping our governments from doing any more damage with corporate rights pacts like the TPP needs to be a priority of the peoples of North America. We must demand an alternative, more equitable and sustainable global trade regime. Trade and investment deals must respect and promote fundamental environmental rights, indigenous sovereignty, labour rights, including equal rights for migrant workers and people of color. Communities and local governments need to be able to actively create high-wage, high-benefit jobs in ways that do not undermine the well-being of our sisters and brothers globally. Governments must be able to promote democratic public policies in the public interest without fear of catastrophic lawsuits in non-democratic and non-transparent investment tribunals. Free trade creates rich people not rich communities. We have 20 years of evidence from NAFTA — we don’t want any more. 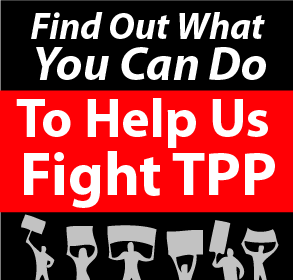 Stop the TPP! Visit this website to sign the tri-national statement of unity against the Trans-Pacific Partnership, and to sign-up to be more involved. Raul Burbano is the program director of Common Frontiers (Canada). Kristen Beifus is the executive director of the Washington Fair Trade Coalition and Manuel Pérez-Rocha is a member of the Mexican Action Network on Free Trade (RMALC) and an associate fellow of the Institute for Policy Studies (IPS). This article was originally published at TheTyee.ca and is reprinted here with permission.